Who knew sleep could be such an adventure, but that's exactly what it's been turning into. It's bad enough I can barely sleep on my side without feeling dizzy these days. My go to stomach position has all but become impossible. Lets just say the quality of my sleep has gone rather down. Which has turned sleep into a rather nightmare of sorts. But of course than there are the real nightmares. Those things that appear in our dreams, leaving us sometimes crying, screaming and trembling in our sleep. And that's exactly what happened last night. At 4 am awoke to find myself gasping for air, even swallowing felt hard. At that moment the dream I just woke from distinctly came to mind. Recalling the hysterical crying that had been taking place in the dream. Of course in the still of the night, as I sat there trying to tell myself it was just a dream a revelation of sorts pops into my thoughts. How there are inherent moments of life that no one will understand but the person experiencing it. In those moments it can feel rather lonely to think that no one else understands how we feel or what exactly we experienced. Even the deepest connection with another soul may not be able to penetrate such moments. It's crazy how dreams can affect the body though, the hysterical crying and upset feeling of the dream had a real impact on my body. As I sat there trying to catch my breath my whole body felt as if it had been more than just a dream, it's unreal how realistic dreams can feel. The emotions and physical reactions they are capable of producing in the body is fascinating. Eventually I dozed off, unbelievably enough into the same dream! Which is even more fascinating because I had been awake for at least half a hour. It's amazing how dreams take us into a whole other realm. It's always interesting the people that show up as well past, present and complete strangers too. Places we may or may not have visited before. And things as well. Would love to know why we dream what we do. 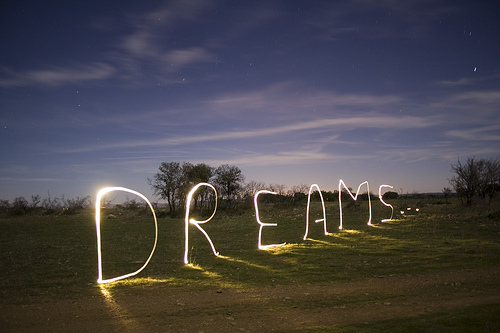 Do dreams have any significance? Are there lessons or messages to be taken from dreams or are they just a random compilation of things we think about and encounter?